After an extended siesta, Big Roll is back. Webmaster Ed Case, who failed to return to the Frinton-on-Sea Home For Distressed Engineers after an evening stroll one day in 2014, has finally been located camping in a beach hut near Jaywick Sands. His great-niece has explained to him how to use The Cloud so with the help of a large-print instruction book, a thermos and a supply of chocolate chip cookies he is finally able to bring you the updates you all crave. 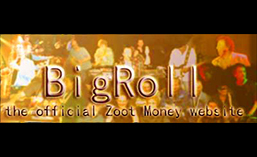 Welcome to the all-new Big Roll website. Currently under reconstruction – “normal” service will be resumed shortly. This is the online home of British blues musician Zoot Money. Very much alive and still gigging. Details to follow. In the meantime, here’s Zoot talking about the early days.